In talking with other homeschooling parents I often hear them voice different fears and concerns. They worry about the child who was reading well last week who suddenly can’t sound out his own name or their daughter who has completely forgotten her math facts. Have you had this happen in your homeschool? Do your kids suddenly have academic amnesia? Tiger (2nd grade) has taken a very long time to learn to read. He’s still making progress but is not a fluent and independent reader yet. I kept trying to compare him to other kids and I was worried that he was behind or that he had a learning struggle. Curly (4th grade) has been a terrible speller. She refused to apply spelling rules. However, during our spelling time she could apply the rules and often spell words correctly. When it came time to write in other subjects, she spelled words incorrectly on a regular basis. She somehow seemed to lack the ability to sound them out to check spelling and she didn’t even recognize that they were not even close to being spelled correctly. When my kids sound out words they often leave out sounds that are clearly in the word. A word like”protect” can become “potet” even though they sound out each letter individually. However, when it comes time to blend them together, many of the sounds are missing. My kids can also do the opposite and add in extra sounds or even syllables. This means that “went” can change to “wind” and “sing” can turn into “sinning-ging.” In those moments I wonder if I’m losing my mind or if we’re not reading the same page. There have been some weeks when Curly cannot add two numbers together (even when they are simple digits like 8+4) or she struggles to subtract. I’ve been baffled as I’ve grabbed the abacus and demonstrated the facts to her. I’ve had her practice with flash cards or do an addition drill page. When I listen to Curly read aloud she doesn’t stop at any period, comma, or other punctuation. She reads like each paragraph is one giant sentence that is smashed together until it no longer makes sense. If a word has more than 2 syllables she doesn’t stop to sound it out but rather makes a guess that defies logic and all phonics rules. She just skims through the sentences and leaves out half of the words. I sit next to her and try to follow along but question if we are looking at the same page. Tiger’s handwriting is so terrible I can’t tell a “y” from an “r” or an “s” from an “e.” I coach him on correct letter formation and we practice on the white board or on lined paper. Yet he still writes like he is scribbling down random code words. In the face of this discouragement, I question if I’m an effective teacher or if I’m absolutely ruining their educational experience. I wonder if their brain has completely fallen out of their heads or if there even was a brain in residence. I feel like a complete failure as a teacher and question why I ever thought I could homeschool. And I’m not the only homeschool parent who faces these challenges and failures on a regular basis. I’ve learned a thing or two about age appropriate expectations for young elementary children in the short time that we’ve homeschooled. For example, it is completely normal for a child to use spelling rules during spelling time and then seemingly refuse to apply them in every other subject. Their brain compartmentalizes the spelling rules and takes them out only during spelling time. For the rest of their school day, those rules are stuffed into a little box that is only used during spelling time. In other subjects, they use other areas of their brain and the spelling rules have not seeped into any other subject. It’s also normal for a student to be able to sound out each letter individually but blend together a strange concoction of sounds and syllables that sound nothing like the original word. It’s normal for some children to lack the fine motor skills to properly form letters when they are writing. It’s totally normal for kids to struggle with simple addition or subtraction facts and need lots of practice and reinforcement. It’s also normal for them to forget more abstract concepts like science and history information. Again, it’s normal for a student who is an excellent reader to have trouble reading aloud, ignore punctuation, and accidentally skip over words on a page. Many of these things are skills that simply take lots of time and practice. In addition, a each child’s brain changes and makes connections at different rates and times. There is quite a wide range of normal. So, sometimes you need to relax and realize that you can take a deep breath and remember to have age appropriate expectations. Some things just come with time. Disclaimer: Of course, if you have questions about your child’s progress or development, seek to find answers. It is always best to diagnose learning difficulties early so a child can receive adequate help. Many of the things I’ve learned have been through researching or talking with those who are trained to recognize problems. They have assured me that my children are on track and are progressing in a way that is age appropriate. It is nice to have that reassurance but it’s been even more important for me to understand and have proper expectations for my kids and their ages. Does that help calm some of your fears? This academic amnesia is common. My kids suffer from it weekly and when I talk to my homeschool mom friends, I am always assured that their kids struggle too. Just keep reminding yourself to keep pressing forward. Concepts will slowly begin to sink in and kids will begin to master the material. It just takes a lot of time – it’s a one step forward and two steps back process! Check out these posts for further reading. I'm right on board with your thinking but what I struggle with is deciding (or finding out) what age appropriate expectations look like for a normal/average child. As homeschoolers, we don't have a lot of points of comparison. Most of us don't have 2/3 kids of the same age in our homes. In a classroom setting, a teacher can probably study the class and come to some conclusions based on the skills set of the majority. I know there are books like "what your 3rd grader should know" etc. but I've always been unsure about those. 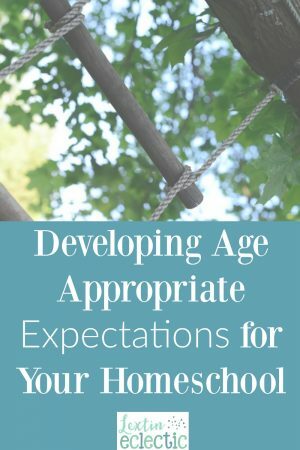 How do you recommend we determine what age appropriate expectations are? My approach has been to compare their current work with their (recent) past work and always strive to see improvement. So, if my 3rd grader could do 60 math facts problems in 4 minutes last month, I set that as a standard and give her the goal of shaving a few seconds off that time (looking also at accuracy of answers). The problem comes in areas that are not so easily measured like reading and even writing. Anyway… just my thoughts. This was a timely post as I was processing through a similar thought process. Thanks Lexi! Yes. I think we've all been there! I wish someone had warned me about this before I started homeschooling. There were so many days that I thought I was absolutely crazy for thinking I could do this. It's nice to know that my kids are normal and that I am too. This is just part of the learning process! Thank you for writing this. I laughed all the way through because it was so familiar! It’s rare to hear about the struggles folks are facing in their home schools. This was very encouraging. You’re welcome! I’m glad you found it encouraging!